Justice shakeup: what’s next for Mueller? 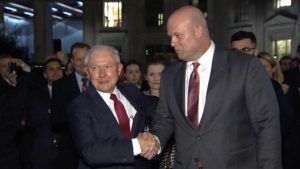 WASHINGTON, D.C. (NBC News) – Matthew Whitaker has been a vocal critic of special counsel Robert Mueller’s Russia investigation. Now he’s in charge of overseeing it, appointed acting Attorney General after Jeff Sessions resigned at the president’s request. Sessions fell out of favor with President Trump after recusing himself from the Russia investigation. “It’s not a coincidence that this man, Whitaker, was picked,” says former Assistant U.S. Attorney Mimi Rocah. Until Wednesday Whitaker was Sessions’ chief of staff, but before that he was a conservative commentator on CNN, where he suggested a strategy to limit Mueller’s investigation. “That Attorney General doesn’t fire Bob Mueller, but he just reduces his budget so low that his investigation grinds to almost a halt,” he said in 2017. There are now calls from both parties on Capitol Hill to protect Mueller, with some even demanding that Whitaker recuse himself, just as Sessions did.